My long bike ride on Saturday (50 miles, zero traffic lights, 2 stop signs each direction) took me out past the Catawba Farm Fest where the Solar Connexion Solar Trailer was set up and supplying clean (and quiet) energy. Solar Connexion, a local long-time solar contractor, has been a generous sponsor throughout this race season and while some might find the pairing of solar and triathlon odd, it's rather a perfect match. After I stopped off at the Solar Trailer for a photo, I spent much of the rest of the ride thinking about the connection between solar energy and triathlon. We are all solar powered! Food - Solar energy is at the root of the food chain, starting with the plants and animals that convert solar energy to starches that are in turn consumed by animals. All that fuels our bodies to swim/bike/run are solar derivatives. Water - Solar energy runs the water cycle which is basically a big storage and filtration system. Hydration is essential to life...and to training and racing! Solar energy created our non-renewable sources of energy like gas, oil, and coal. They are from ancient living things (made possible by food and water, above), compressed and heated for a lonnnng time. Solar energy is responsible for all of our renewable sources include solar, wind, and water. Wind is a direct result of heating effects from the sun. Triathletes seem to have a greater than average understanding of and appreciation for the environment, probably because we spend so much time out in it swimming, biking, and running. Races are "going green" with reduced paper use and other measures. 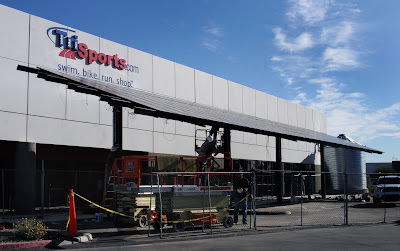 Recently I got a flyer from TriSports.com and discovered that much of their store roof is covered in solar panels enabling them to create about 90% of their energy!! They share information on their blog about the water, gasoline, methane, and carbon dioxide that is "saved" from their 128 kW system. It's impressive. 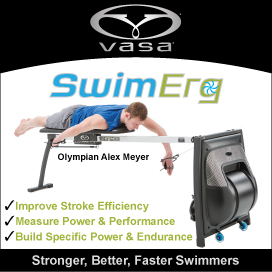 Their use of solar will definitely factor into my future online triathlon purchasing decisions!! My interest in renewable energy sources dates back to my involvement as the course coordinator for Virginia Tech's Earth Sustainability Series and teaching a Sustainable Energy class in the College of Engineering. I served as the co-PI for the Blacksburg Wind and Solar Power project at our local Y where I first met Bryan Walsh, owner of Solar Connexion. He donated considerable time, expertise, and materials that made the project possible when I was way in over my head. I'll wrap this up by reiterating that triathletes ARE solar powered, so now it's time to bring it home. If you can swing it, call up your local solar contractor and at least look into solar for your home. For less than the price of a Prius, you can be well on your way to energy independence. Yeah, it's about the small changes, but frankly, we need to be making some BIG changes to turn our environmental problems around. I believe triathletes can help lead this charge. or let me know if you utilize solar at your home or workplace. 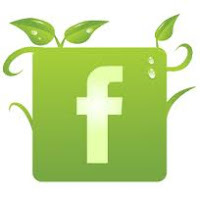 If you are interested in solar energy, please "Like" Solar Connexion on Facebook! !